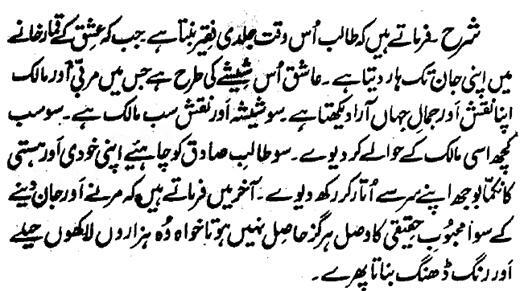 Here Hazrat Sultan Bahu Rahmatu-Allahe Ta-aala Alaihe says that 'the Seeker becomes Faqeer sooner at that instance, when he has lost his life in bet at the casino of the Ishq. Aashiq is like that mirror in which the Mentor and Lord sees the display of his (or His) reflection and the World of Beauty. Hence, the mirror and the Reflection all is Lord. Therefore, he should hand all that he owns over to that Lord. So, the True-Seeker should unload the useless burden of his ego and existence from his head. At the end, he says that the Wasal of the Real beloved can never be achieved as long as one has not died and has not sacrificed his life no matter how much great schemes and garbs he applies.